We assembled the pieces and then used a black Sharpie to add hair, a nose, a mouth, and fangs. 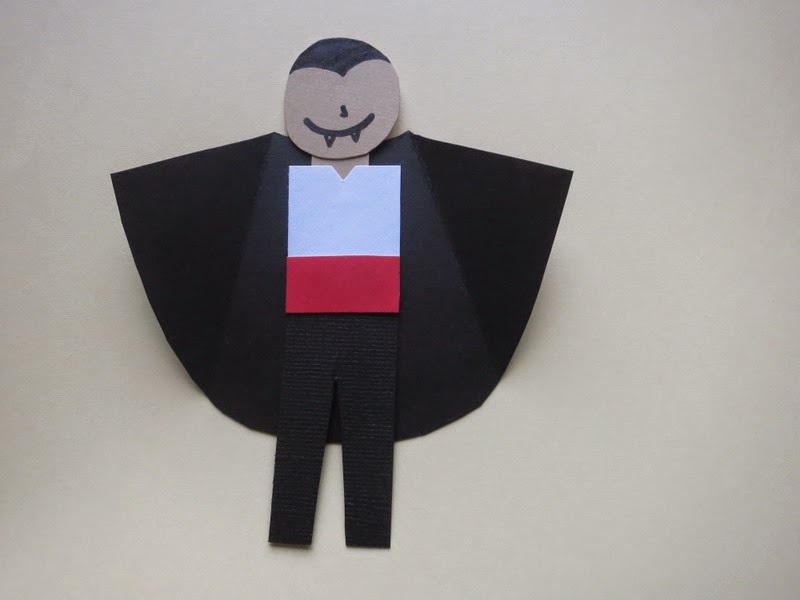 We attached our vampires to white card bases and folded up the capes. At that point, I added feet because it looked weird without them. Trevor disagreed and his vampire remains footless. When you open the card, you can see the message. Not the most traditional birthday image, but fun none-the-less. According to Brookie ... Oct. is only a month and a half away (her birthday month, so she should know! LOL!!) ... I loveeeee these!!!! So AWESOME!!!!!!! I vote birthday card for an adult and inside you could write: You're ageless. Super cute. Love how these turned out. Hahaha....such a fun birthday card!